Crushing seeds and grains before swallowing it. Such beak is called crushing beak. 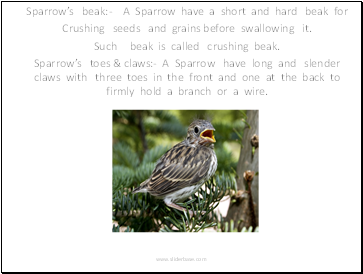 Sparrow’s toes & claws:- A Sparrow have long and slender claws with three toes in the front and one at the back to firmly hold a branch or a wire. 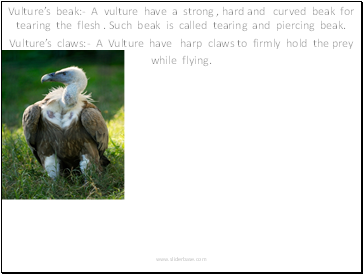 Vulture’s beak:- A vulture have a strong , hard and curved beak for tearing the flesh . Such beak is called tearing and piercing beak. Duck’s beak:- A Duck has a flat and broad beak which has small holes on both sides . It digs up the food along with mud from the base of the pond or lake . Its beak pushes out mud and water from the holes leaving the food behind. This process is called sifting. 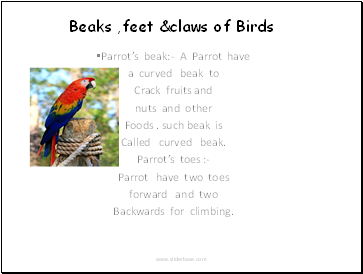 Such beak is called sifting beak. 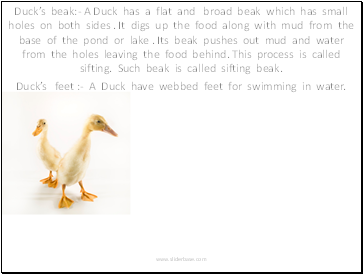 Duck’s feet :- A Duck have webbed feet for swimming in water.